All of these posts revolve around the basic theme of how ridiculous a narrow focus on money really is when we are talking about government. Fundamentally, these arguments all boil down to money - how we're spending too much, the cost of repaying the debt, and so on. This is "banker speak". Bankers think in these terms, because that is their framework of understanding. A banker doesn't bother to look at how the monies are being used, the policies that they are supporting, how the public benefits from it. No, they only look at the money and their ability to make further profits from it. Then, as if to underscore my point, we get this "study" out of Goldman Sachs which basically says "curing disease is bad business". I have long believed that the corporate business mentality which places profits ahead of "doing the right thing". Medicine has never been about making huge piles of money - it has been about helping people. Talk to anyone going into medicine, and you will rapidly find that money isn't the top of their list of motivations (yes, doctors are well paid, but few who go into the field do so primarily for the money they can make). Doctors like Jonas Salk created vitally important cures for diseases like Polio - and gave them away because they understood that the benefit to the world vastly exceeded any short term pecuniary interest. There's an old saw about conservatives: "Conservatives know the cost of everything, and the value of nothing". Bankers are in so many ways the "original conservatives" - the only thing they have ever paid attention to is money, and making money using money. Borrow to buy a house? Cool. But never make the mistake of thinking that the bank will be there to help you out if you fall on hard times. The analysis of the investment bankers at Goldman Sachs echoes criticisms made about Alberta's 2018 budget. The 2018 budget has been criticized for not laying out a clear plan to achieve a balanced budget, how it's "racking up the debt" and so on. Like the Goldman Sachs commentary on gene therapies, this is a very narrow focus. We should also be asking where the money is going, what are the benefits to society, and so on. Just as good medicine isn't necessarily "good business", good government isn't good investment. We should never lose track of that reality. So, this week Albertans were treated to a column from Ian Brodie on the subject of building hospitals. Mr. Brodie is a former Harper advisor, so we shouldn't be too surprised that he doesn't especially like the idea of spending public money on projects that he or his companions can't directly profit from. However, a lot of Mr. Brodie's comments aren't merely rooted in the long standing right-wing desire to privatize everything in sight. No, they are rooted in some the most malicious ignorance I've ever seen on display - and considering that this blog has been running for fourteen years, now, that's saying quite a lot. 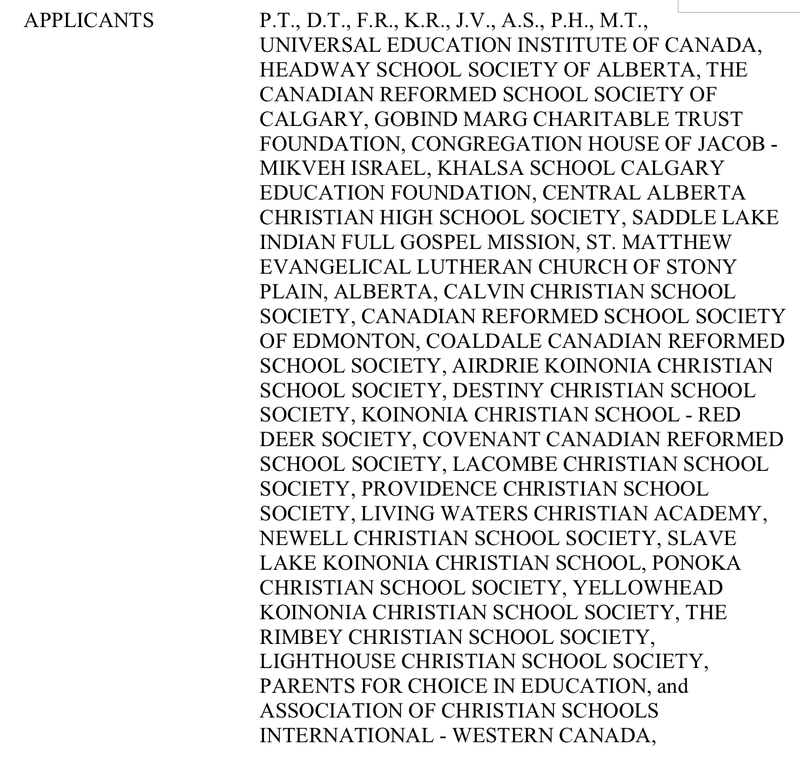 So, apparently John Carpay has managed to persuade a bunch of fear-filled people to participate in an attempt to quash GSAs in Alberta schools. Carpay runs a Canadian version of the American ADF under the guise of the Justice Centre for Constitutional Freedoms (JCCF). Although the JCCF bills itself as "defending constitutional rights", it has a long history of taking up what are fundamentally defending religiously driven discrimination (which mysteriously overwhelmingly seems to affect Canada's LGBTQ citizens). 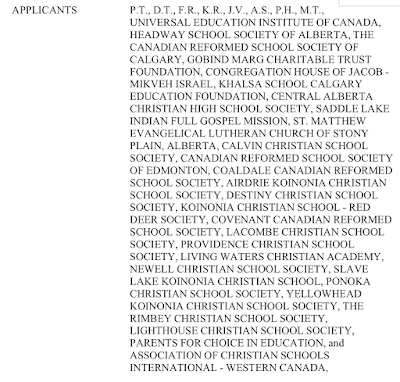 So, let's take a bit of a deeper look at the statement of claim the JCCF just filed in the Medicine Hat Court of Queens Bench, shall we? There is a small handful of individuals, identified only by their initials, and a great long list of obviously religious organizations. Overwhelmingly they appear to represent "Christian" schools. This is not particularly surprising, since the loudest opposition to anything which involves LGBTQ issues is inevitably religious in its origins. I've noticed a few patterns in this country's right wing politics that make me deeply suspicious. 1) Andrew Scheer flies to London to "prepare a trade deal with post-Brexit UK"
4) Jason Kenney writes a letter to Ottawa demanding that our next senator be one of the names from the last "senatorial election" held in Alberta. 5) Rob Ford "dumps" the media bus for his upcoming provincial election campaign. First of all, items 1-4 all have something in common: They have conservative politicians trying to be seen to "be doing things". They are part of a campaign to give the appearance of being serious. On what basis does Scheer think he has any standing to represent Canada in discussions about free trade with the UK? Those discussions have rightly already been framed by the government of the day, long before the Scheer's trip. On this basis alone, I think we can dismiss Scheer's trip as little more than political theatrics. Theatre intended primarily to "impress" an audience at home that has been cool to Scheer as a leader of the CPC, at least in part on the basis of suspicions that he represents a takeover of the party by socially conservative elements who were kept "under thumb" during Harper's tenure. Likewise, Kenney's foray into BC to "sell" is more political theatre. Kenney is not the Premier of Alberta - he's the Leader of the Opposition. Further, given his pugilistic comments regarding BC's opposition to the TMX pipeline project, any speech in BC he might give is undermined by the two-facedness of his presentation. However, the speech I linked to above wasn't a "public speech" - it was a closed door event for conservatives. (Note CPC flag in the background) I was unable to find a copy of the video anywhere except Kenney's own Facebook account. (Oddly, not even on Rebel Media's website - but we'll come back to that). Kenney, to my knowledge, has never met with BC Premier Horgan, or face to face with any of the opponents of the pipeline ... at least not willingly. Similarly, Canadian Senators seldom travel abroad to represent the government. There is good reason for this - that's what we hire diplomats to do. So, the three senators who travelled to Washington this week were doing this for partisan political reasons. It is important to note that Senator Batters has been one of the most vocal Harper-appointed senators, especially with regards to the legalization of marijuana. Again, this can have no official standing with respect to the position of the Canadian government, so all that we can surmise is that this is yet another attempt to show the conservatives in Canada as having "political gravitas". Then there are the items related to media access. Kenney has been good at this for years. It is rare to find full media of his events, even more rare that you would find them anywhere except under his very careful control. There are reasons for this. He never wants to be caught out for what he says. Mass media is rarely allowed in the room when he holds the microphone - a few trusted allies is all. When he does face the public, it's always scripted within an inch of its life, and designed with a purpose. So, when Kenney travels to BC, or when he "appears" on talk radio, it's always done in a context where he won't have to face awkward questions, or any missteps will be quickly edited out. (Talk radio on the whole is notoriously oriented towards the right-wing outrage machine, making it an ideal place for Kenney). Today, we have Doug Ford deciding to eliminate the "media bus". Ever since his election as leader of the Ontario PCs, I've noticed that Doug Ford has become increasingly scripted. If he doesn't have to say anything, he won't; and if he does, it's carefully engineered. Clearly the party is worried about a "loose cannon" moment jeopardizing their chances of ousting Kathleen Wynne this spring. The decision to make it more difficult for the media to keep up with his campaign during the election is interesting. It echoes Harper's distaste for the media, and it erodes the ability of that media to actually cover his campaign - leaving him somewhat freer to pander to the "Ford Nation" base. While I make no secret of my own distaste for the degree of direct control that media owners have come to exert of late, access to our politicians is an important dimension of our democracy. Attempts by our politicians to hide from the media, or to restrict their visibility to "friendly" outlets is a dangerous trend that does a disservice to Canadians. Okay, so what we have here is political theatre. In terms of the governance of the nation, it's relatively minor, right? Or is it? 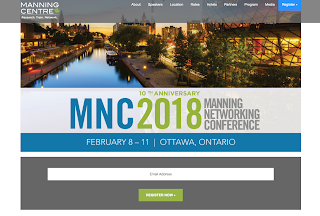 All of this starts unfolding a month after the Manning Centre Networking Conference in Ottawa, which ran in early February. So what? 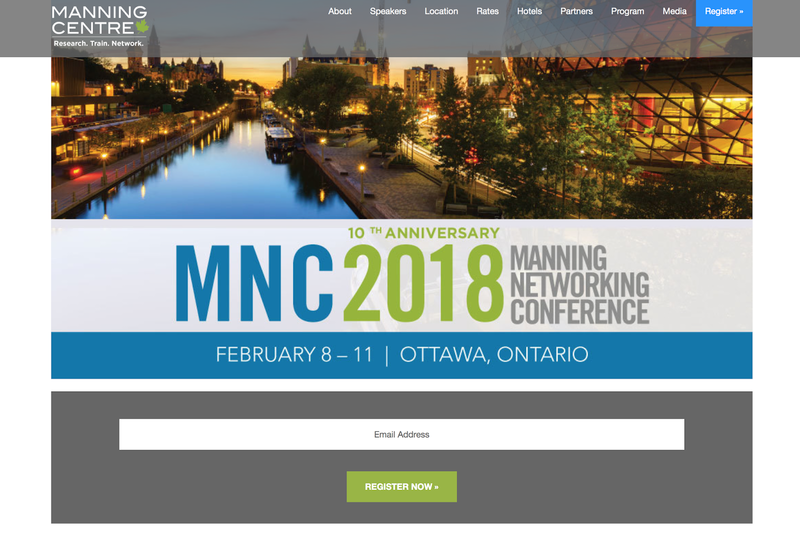 Well - all of the major players mentioned in this post were also "featured speakers" at this year's conference. It would be stunning if there weren't a significant number of backroom strategy sessions happening as the country heads into two or three years of back to back elections at provincial and federal elections. The similarities in strategies being executed is profoundly disturbing. I believe we are witnessing something unprecedented in Canadian politics: a full court press by a political faction using the same strategies at all levels across Canada - and right in the middle of it all, you find a secretive non-profit that appears to be organizing the shots. I have no problem with organizing politically, but the idea of a group of puppet masters pulling the strings from behind a curtain of secrecy is not only wrong, it's so wrong that it stands to damage our electoral processes and the credibility of any government. If you don't want Canada to follow in the footsteps of the United States, this is important.